After a Hollywood summer of white guys in tights, an Aryan superman who just happens to be on our side, a “Top Gun” wannabe with a power ring, and a blue-eyed Norse god, any comic news that has to do with brown folks is welcome. Word is that Marvel Comics is re-launching their Ultimate Version of Spiderman as a bi-racial black and Latino kid named Miles Morales. As a lifelong comic book fan and snarky social scientist I’m both excited and cautiously pessimistic about this change. With a history-defying “post-racial” character taking over as one of America’s best known heroes, are we actually seeing a change in the comic world, or just multi-culti window dressing and angry white backlash? White guys are gripping tight to hold onto comics as their own. That’s why Glenn Beck can have fits about a brown Spiderman even though he doesn’t read comics. In that sense, comics are clearly breaking the mold. The comic industry has its own internal racists as well,which is partially why previous attempts to have worthwhile black heroes have fallen flat. 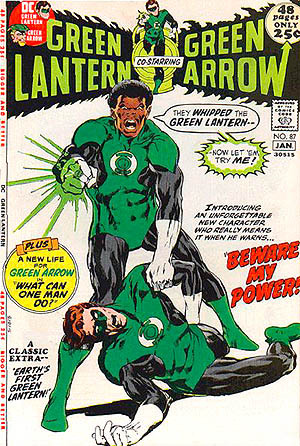 Back in the 1980s, it was all about having a black guy step into the role held by a famous white hero for awhile. Rhodey stepped in to play Iron Man for Tony Stark, and John Stewart stepped in for Hal Jordan to play Green Lantern. But neither of those narratives ever really took off and for good reason. It’s like having a “Black Barbie” — we all know it’s not the real deal. They were just black versions of white heroes. And whenever the white guy got over his hangnail, broken heart or erectile dysfunction, he’d take his job back and the black guy would be a sidekick again. During the 1990s, comic boom black heroes were created but they always had limitations that white characters didn’t have. African-American heroes never had their own powers, just suits made by benevolent, smart white guys. Or, they had super strength and were natural athletes — always lame abilities that paled in comparison to white guys who could level buildings with a thought, or set a forest aflame with a look. The most popular comic of the 1990s, “Spawn,” starred a black guy, but he was cursed by Satan to never be able to show his true face.The one highpoint from this era was Milestone comics, which gave us the cartoon Static,but in most cases it was still a white man’s world. In the new millennium we have what I call “Multi-Culti-Stuffing,” where minority characters are introduced, but in a stunt-casting way. It’s almost as if writers are saying “Let’s make him Asian, gay and Jewish — a three-for-one diversity hit!” White heroes are re-imagined as Asians (always acceptable to the racist fanboy) or multi-racial, or occasionally black. Characters are suddenly turned gay, but only if they are minorities or minor characters. This is partially why the new Spiderman gives me some vague hope that the sins of the past aren’t going to get foisted on us again. Miles Morales is taking over for Peter Parker who died. He ain’t coming back to reclaim the mantle. Next, Morales has his own legitimate powers just like Peter Parker, not some lame suit built by a crafty Asian scientist. Finally, he’ll be depicted as the classic teen Spiderman as opposed to “Diversity Check-Box–Spidey” who only battles pimps, pushers, hoes and homophobes. It seems that moving forward the question won’t be about having more minority heroes. Heroes of colore seem inevitable, whether it’s the new “Black Batman”coming out this fall, the black-white buddy cop remake of the 1980s “Firestorm” comic, or Morales’ Spiderman, minority heroes are appearing the norm in modern comics. The question is will they be allowed to grow and evolve as characters in their own right, not as Avatar-like fantasies for white liberals, or as bugaboos for old-school comic fans. We just want to see superheroes fighting the good fight. There is great power in these images for kids and adults alike, and like Peter Parker once said, “With great power comes great responsibility.” I hope the new Spiderman writer takes that to heart.